Enjoyed a great time at The Oaks Camp in Lake Hughes, CA this weekend. 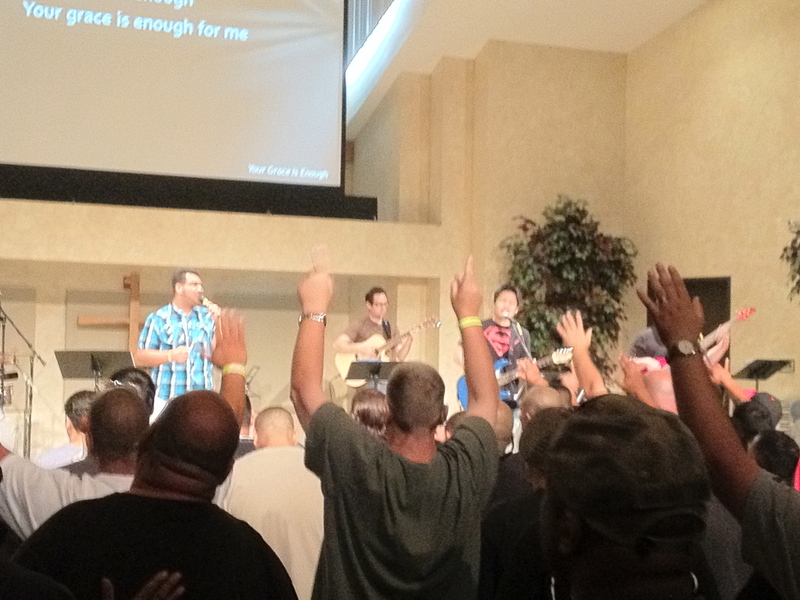 A group of men from Harbor Mid-City attended the men’s retreat hosted by World Impact. World Impact’s mission is to evangelize and disciple the urban poor. It was quite an experience being with men, many of whom had come from some very difficult backgrounds. Yet Christ reached in and saved them. We are all on a journey with Jesus, just at different places on the journey. I loved seeing the grace given, and seeing some tough dudes who are now sold out for the savior. Stephen Phelan, pastor of Harbor Mid-City thought this would be a great opportunity for the men of Harbor from both the Spanish and English church to come together for this retreat. These men are in training to be leaders at the church. The church will not grow if it doesn’t have strong, godly men to lead it. We sang in Spanish and English, as it was a bilingual conference. The main speaker, Don Davis spoke about the warfare we are in from Ephesians 6:10-20. Our battle is not against flesh and blood. Therefore our armor must be different. God does protect us. He does gives us armor. We would be hopeless without it. We march forward in God’s armor. Pray that the men of Harbor would grow in faith and practice. That daily they would put on the armor of the Lord, and be true warriors for Christ. I’d also appreciate your prayer as we go out to share the love of Christ with Pastor Leo and his team in Rosarito, Mexico today. We are going to share in the neighborhood where the church is located. God bless you and my prayers are with you as you go! I loved the bilingual singing! I continue to pray for you and your Christ-centered work.